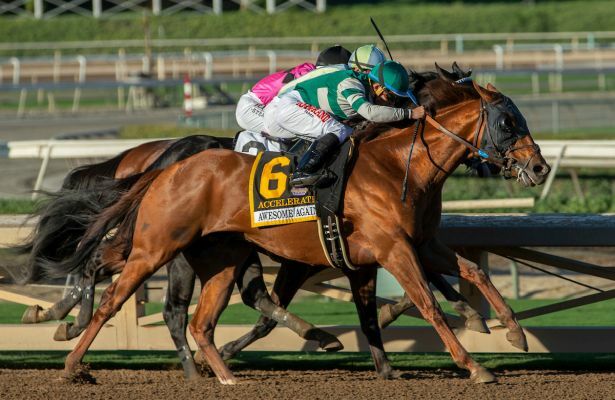 Accelerate — winner of the Big ‘Cap, Gold Cup at Santa Anita, Pacific Classic and Awesome Again Stakes in the same season — will take his show on the road in the Breeders’ Cup Classic. The latest Las Vegas odds on him tell two things: Accelerate has a good chance of winning it, and there’s no value left in betting the John Sadler trainee ahead of the Nov. 3 race at Churchill Downs. William Hill US lists Accelerate as a 1-2 Classic favorite leaving the weekend, by far the lowest price on the board from more than 30 interests. That prospective field should be trimmed soon with preps for the 1 1/4-mile race finished. Behind Accelerate, the second choice is Diversify, who’s 6-1 after fading to fifth in the Jockey Club Gold Cup. The speedster carved out early fractions he could not maintain late. West Coast, second to Accelerate in the Awesome Again, is 8-1 along with Travers Stakes winner Catholic Boy. William Hill’s fifth choice is Woodward Stakes winner Yoshida at 10-1. When it comes to betting the Classic, save your money on at least a few of the contenders on the board. Hofburg and Elate are no longer under Breeders’ Cup consideration, while Tapwrit is retired, Core Beliefs should be done for the year, Tenfold is turned out and Lone Sailor will look for other spots. Here’s a full look at horses on the board at William Hill. Click in the bottom right corner for full screen viewing.